This well-known winged mammal (in Hebrew , Lev. xi. 19; Deut. xiv. 18; Isa. ii. 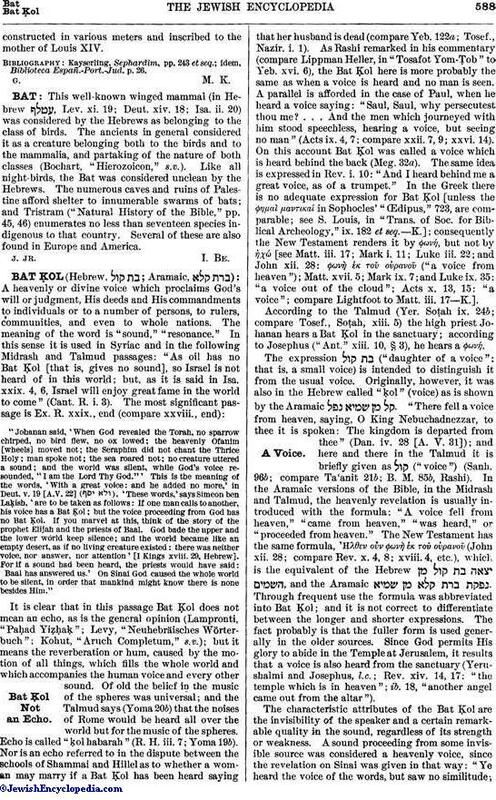 20) was considered by the Hebrews as belonging to the class of birds. The ancients in general considered it as a creature belonging both to the birds and to the mammalia, and partaking of the nature of both classes (Bochart, "Hierozoicon," s.v.). Like all night-birds, the Bat was considered unclean by the Hebrews. The numerous caves and ruins of Palestine afford shelter to innumerable swarms of bats; and Tristram ("Natural History of the Bible," pp. 45, 46) enumerates no less than seventeen species indigenous to that country. Several of these are also found in Europe and America.